I had thought that these, along with short lengths of the same molding and other pieces of wood, should be enough for our 6 months anniversary trip and adventure. 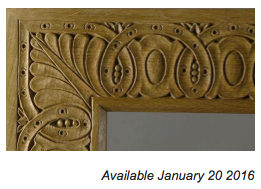 But, what should come across my emails today but Chris Pye’s carving newsletter. I had some correspondence with him regarding picture frames and he mentioned that he had a frame in the works with a video workshop scheduled for early 2016. Well, in this newsletter he had a snapshot of the frame and I decided right then and there that this would be my Scottsdale Challenge! The intricacy of the carving is so far beyond my current skill level that I just had to challenge myself with it. I’ve done an acanthus leaf but nothing like this with all of the scrolling elements, leaves, and berries. I asked Diane what size of a frame she’d like to see this in and her reply was a 16″ x 20″. After studying this small image I see that there is a simple chamfer on the sight edge and the rest appears to be flat. A good width for a picture of that size is around 4″ so that’s what I decided to go with and fit the pattern to that. So, my dilemma today and the thing that kept me from checking off items on the to-do list was making this frame. Since I won’t have any of the needed tools to assemble a frame in our Scottsdale apartment, it had to be made here. The choice of wood was next, the screen grab I took seems to be a light colored wood such as Oak or Birch. I prefer a darker wood so decided to go with Cherry which carves pretty nicely. After going through the stacks at Peterman Lumber and finding that most pieces were full of sapwood I decided to see what was available in the premium priced wide stock. When I build furniture it’s important to me to have the wood come from as few boards as possible and also as closely matched in color and grain as possible. I uncovered this 8′ board that is over 12″ wide. You probably notice the checking and splits on the right side but there was over 8″ of good material on the other. The coloration was even and most importantly — no sapwood! Once home, the first step was planing a working edge followed by ripping to a uniform 4″ width. Next up, a 1/4″ chamfer was cut on the tablesaw for the sight edge and sweetened up with a block plane. 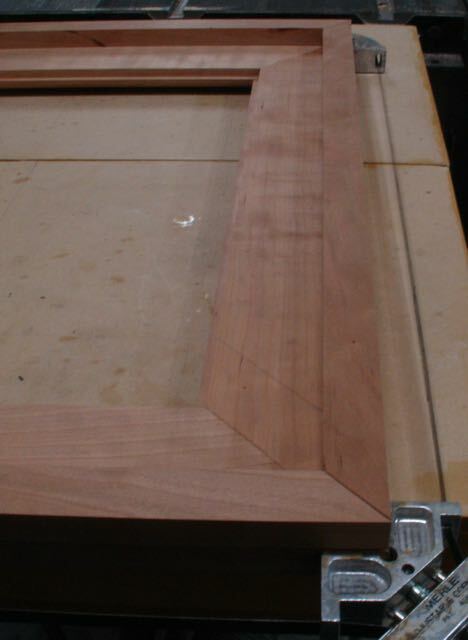 Rather than take the time to set up a dado head the rabbet was cut in two passes with this being the resulting profile for the frame. 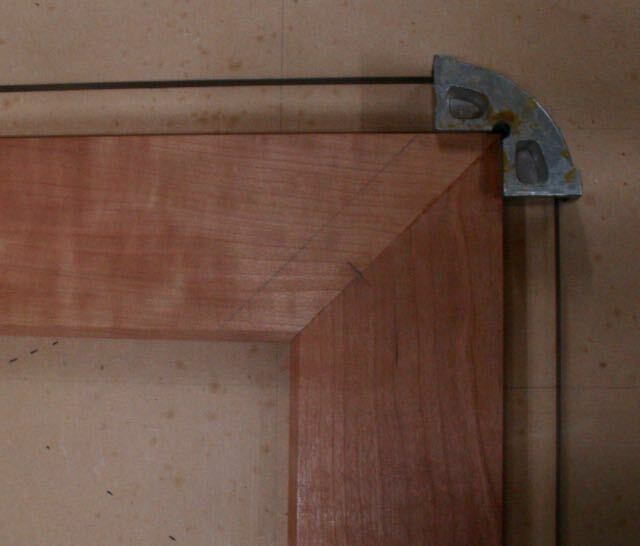 This complete the corners were mitered, cut for a #20 biscuit, and glued and clamped. Diane paints on either 1/4″ panels or stretched canvas. As it is now, the frame can only be used with a panel so I’ll add another 3/4″ piece on the underside so a stretched canvas will fit as well. I think a frame that is only 3/4″ thick looks rather anemic, especially for a frame of this size. Rather than have an extra band like the tongue and groove one on the recent Tropical Walnut frame this one will simply be mitered and glued to the bottom of the frame. After planing the sides even it may be embellished with a few small coves. The pieces are rough cut as you can see in this picture but I’ll do that first thing tomorrow morning and then honest; I will get to my to-do list! Knowing that we’ll have a 6′ x 12′ trailer plus the back of the truck and Diane’s Mini means we need to pack light. Besides clothes, pots & pans, dishes, cat & dog stuff, minimum furniture (blow up bed!) we also need to take the tools of our trade. For Diane that means all of her canvases and panels she’s been busy preparing, easel, brushes, paints, solvents, etc. I need to not only take the carving chisels and mallets, plus sharpening equipment, planes, gilding and toning supplies, air brush, solvents, and on and on. It’s somewhat ironic that while we’ll be living like college students a number of friends and family will be enjoying the comfort of our home! This entry was posted in Picture Frames, Scottsdale Adventure and tagged biscuit joiner, Cherry, Chris Pye, Edwardian frame, mitered corners, Scottsdale. Bookmark the permalink. Can’t wait to see this one, your frames just keep getting better and better!